Its tough getting time to draw currently. I have virtual access to my workplace so it follows me everywhere, into evenings and weekends. Tomorrow, I hope to go out early and draw. 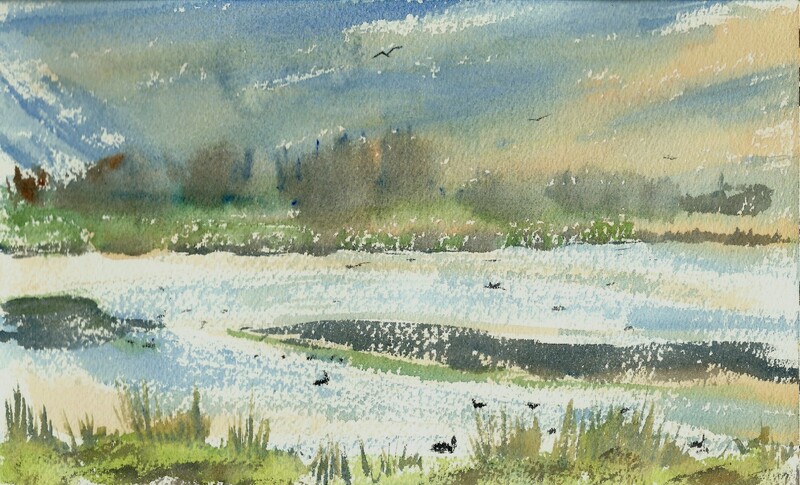 I admire the work of Yorkshire artist, Jo Dunn. 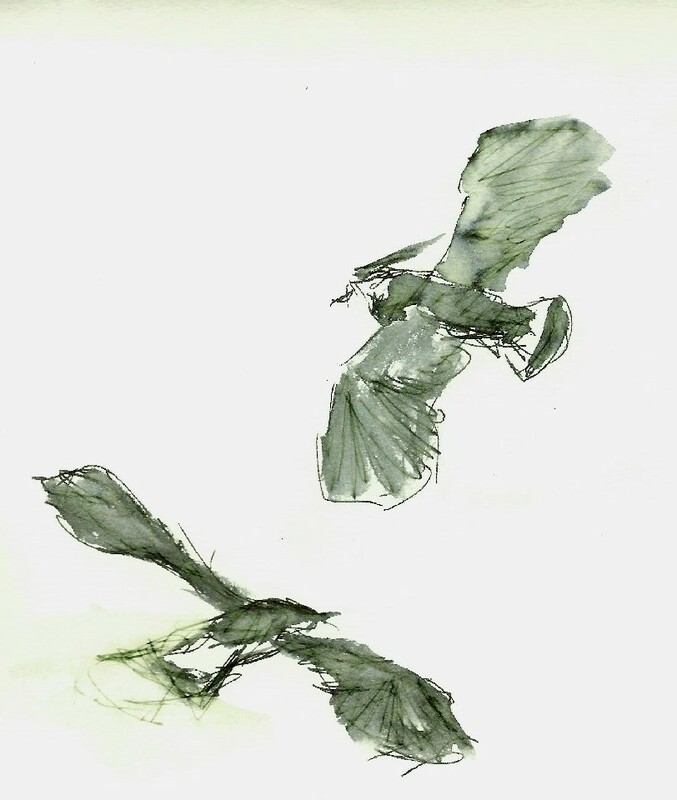 What strikes me is the way she uses the unpainted paper so skilfully between her bold strokes. These pieces were painted in half an hour each at the waning of a March day before cycling home. 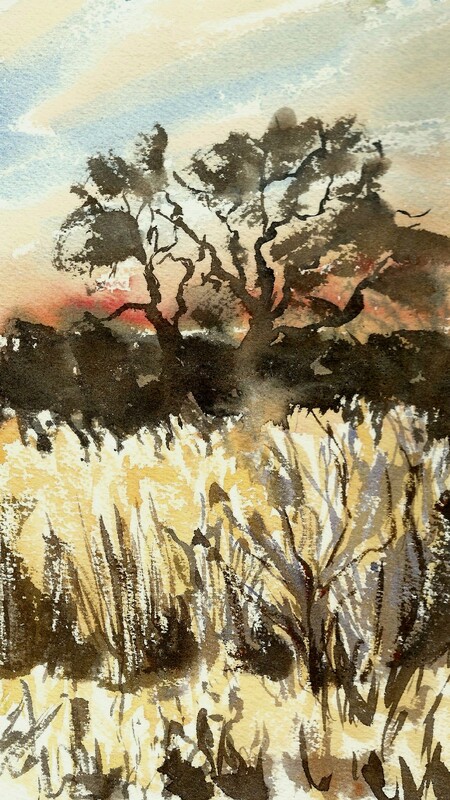 I tried consciously to use white paper in the composition, but the results are very different to Jo’s approach. I am going to try again tomorrow. If I can interpret the scene with gaps between bold marks, it is because I have Jo’s example in mind. I am marking the assessments on clinical trials for our MSc course. Candidates repeatedly use the word “traditionally” to describe clinical trial designs. Tradition means we do things this way because this is the way we have always done them. The one thing trials should not be is “traditional”. Each experiment that relies on human participation must be designed anew to reflect unique circumstances – this population, that drug, these objectives and so on. Clinical trials are rigorous experiments. They have to be. Our model of human experimentation has been forged in the fire of scientific rationalism and shaped by the hammer of human rights. 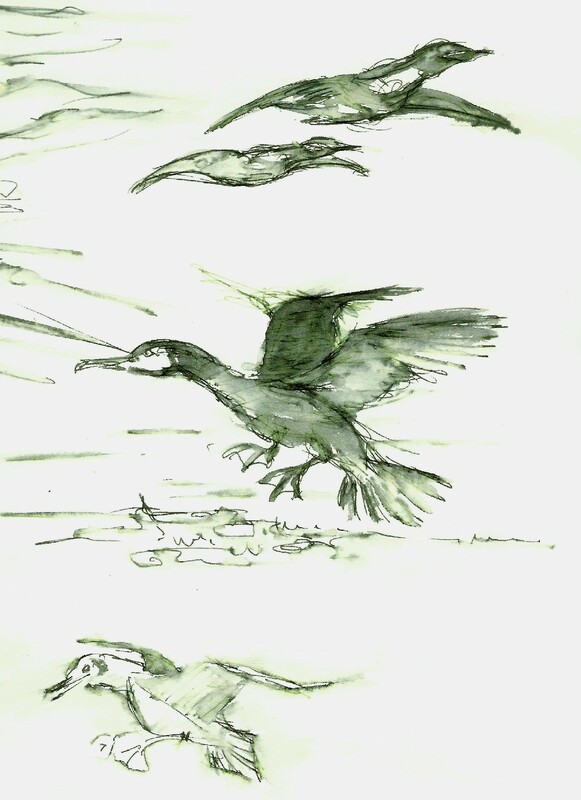 One reason for me to watch and draw birds is as icons of slow but inexorable change across deep time. I can never forget that this group living all around us is allied closely with the venerable titans that dominated the Mesozoic Era. 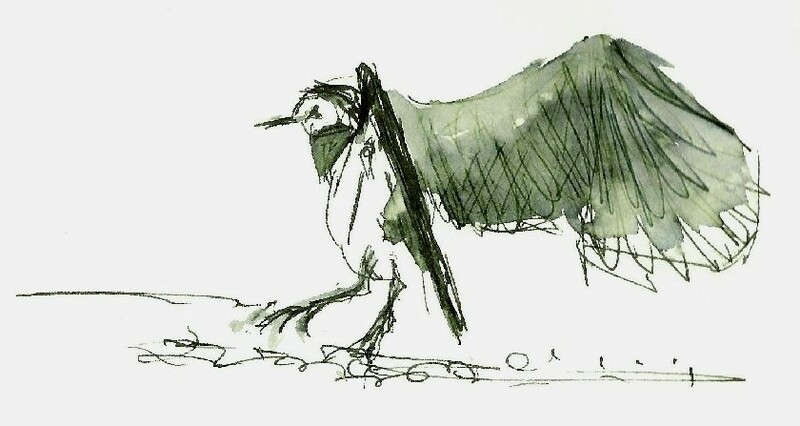 Conversely, the patterns of behaviour I try to capture today have been repeated year on year, millennium on millennium and were probably similar when humans used rocks as tools and themselves drew the wildlife in charcoal and ochre. Above, a herring gull casually displaced a black headed gull. The smaller bird rose and made a show of defiance which was observed without concern by the invader. 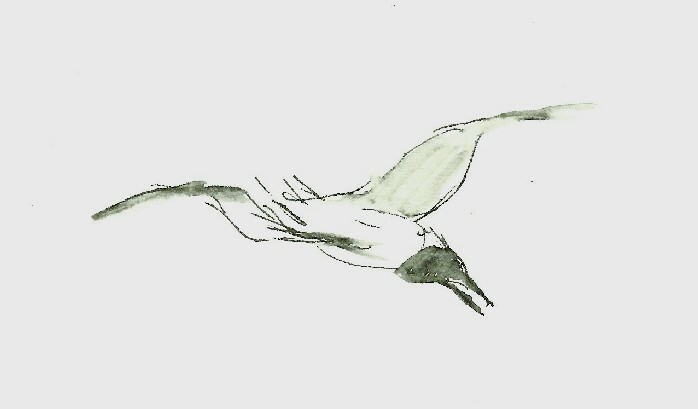 Below, a juvenile black headed gull entered the space of an adult, which threw itself backwards to drive away the youngster. 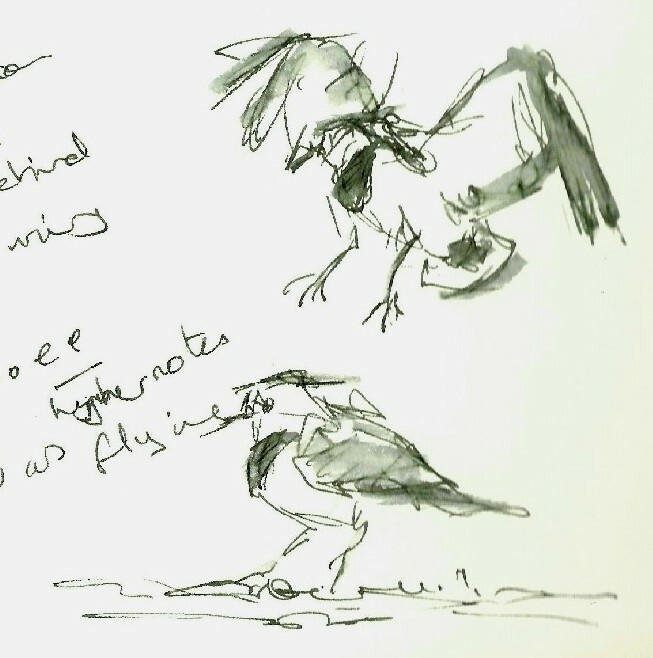 Periodically, birds dropped from the air and the relationships of the pairs and rivals were re-established by displays of dipping heads, inverted arched necks and spread wings. 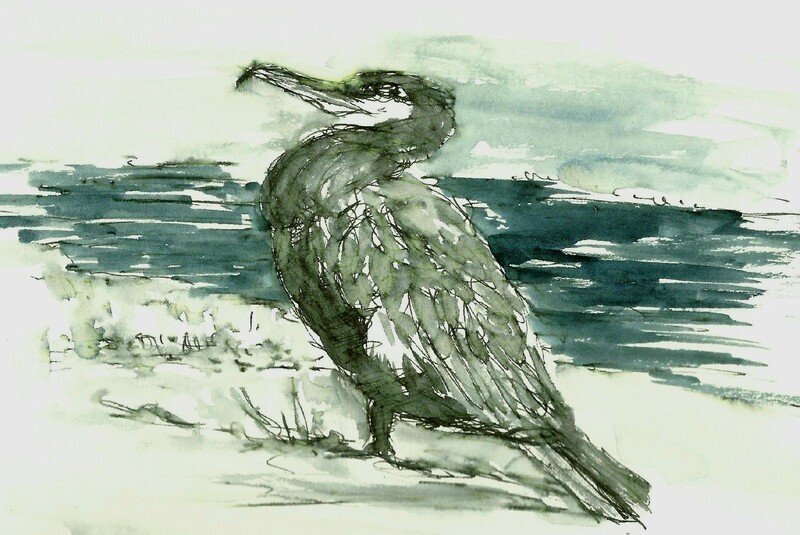 A recent post by artist Leonie Andrews commented on the way the paper in a Moleskine sketchbook sucked in ink from her fountain pen and the watercolour wash beaded. I also have a Moleskine sketchbook and took this out again today. 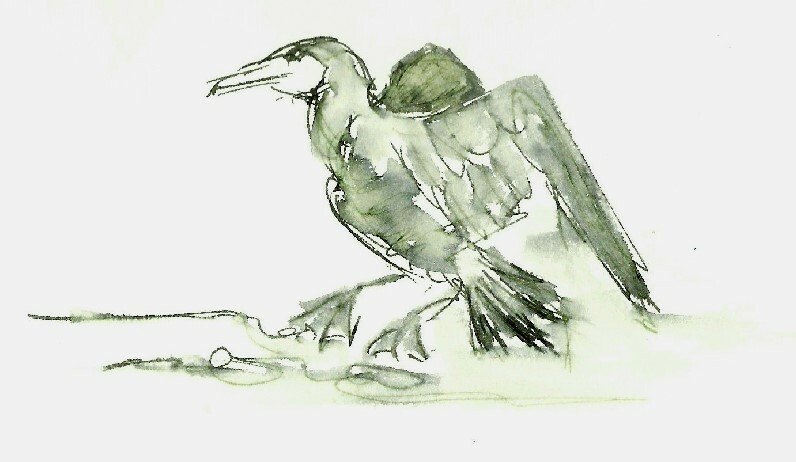 Mostly I use a Derwent book containing cartridge paper. 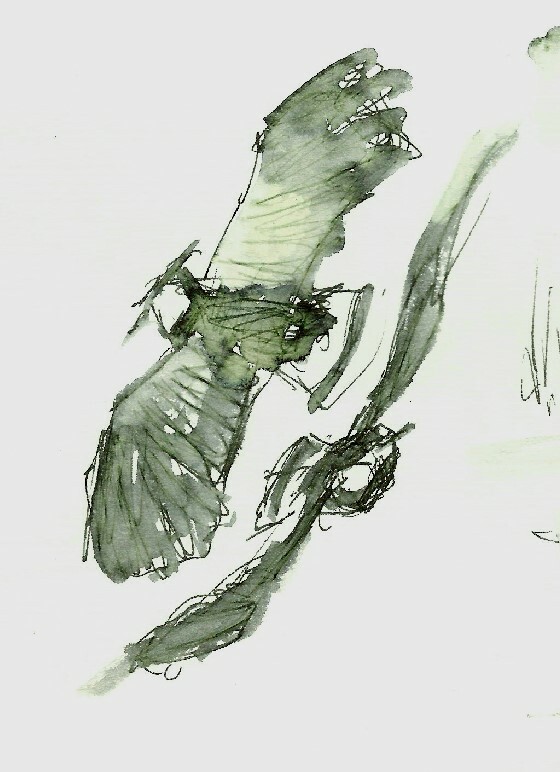 Above are some of my first sketches after I bought my Lamy safari fountain pen and brushpen. 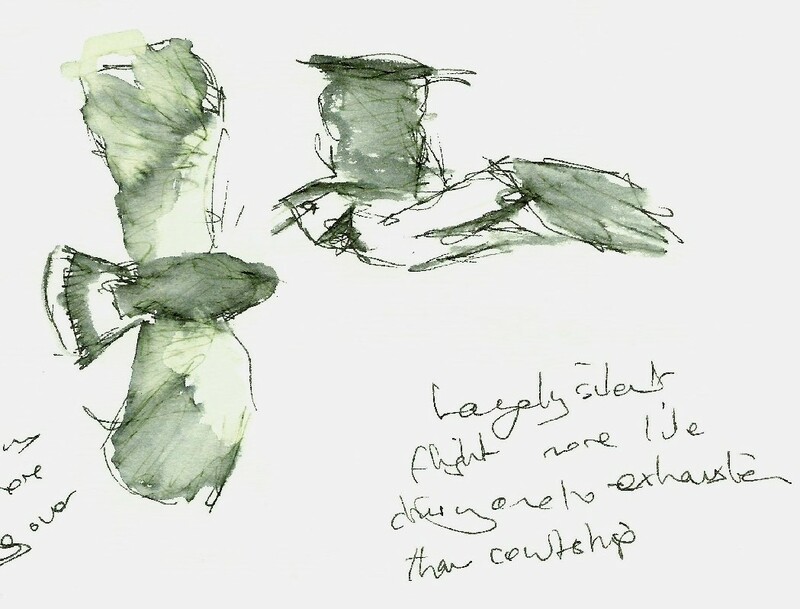 This is the combination I have been using for all my recent bird drawings in the field, except that now I also use a water wash to loosen the lines. 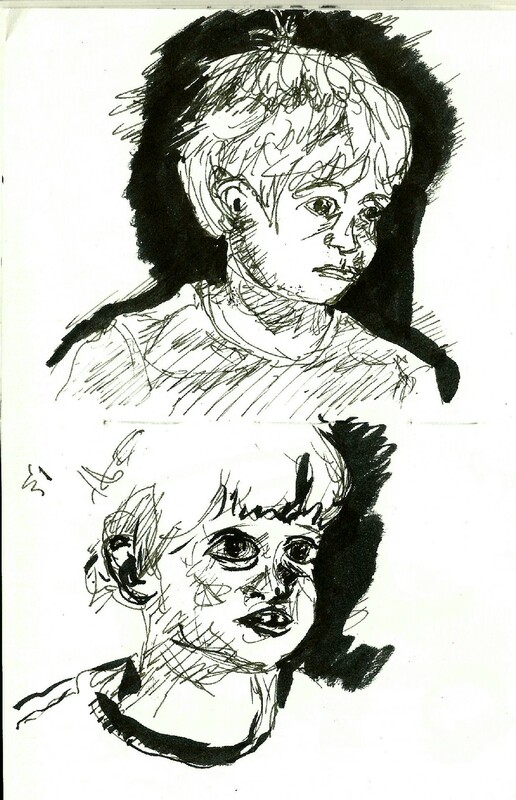 Today, I sketched the same subject, my son, while he squinted into the sun and addressed a bacon sandwich after we had been cycling. 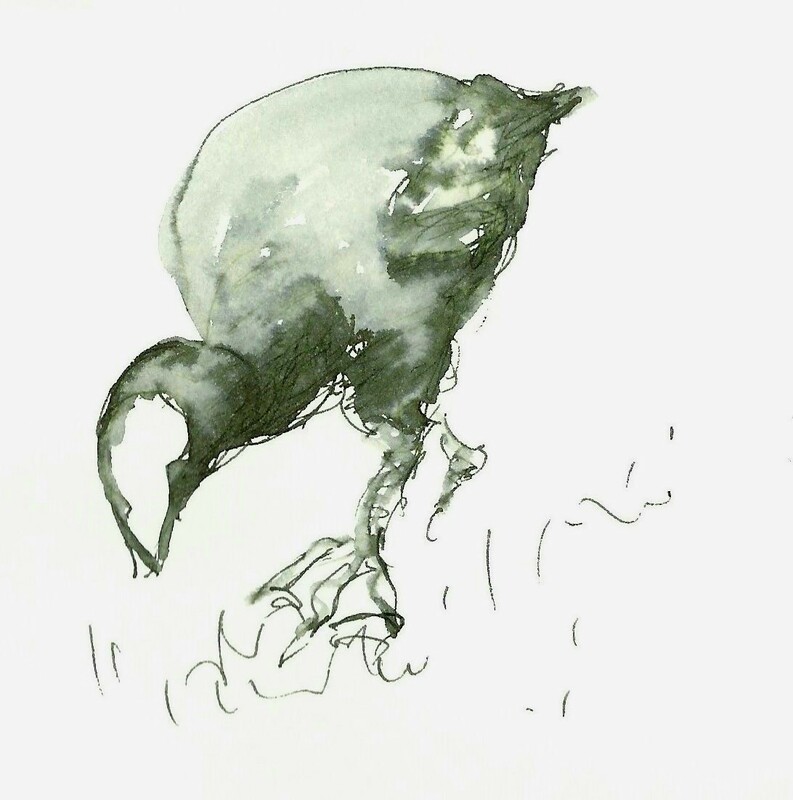 It is an unflattering sketch and inaccurate – I have got the proportions wrong and so he looks way too old. in my defence, he most certainly did not model for me, but chomped and looked around while I drew fast. 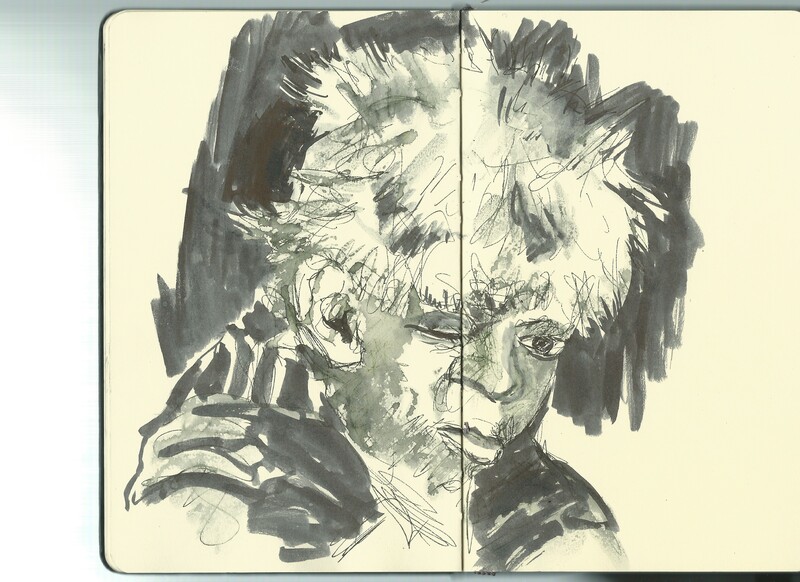 Still, the point is that this sketch was done in the Moleskine notebook. 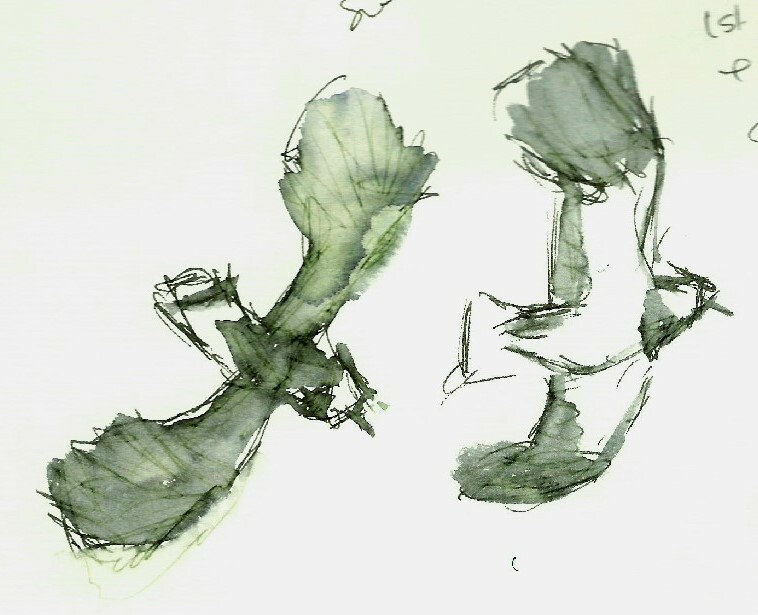 The water wash does move the ink but the paper underneath serves as a resist. I like the way it dries after beading. This makes for a dynamic texture. Its just a question now of my learning to use it right. Marsh Lane 8th March, sunshine and clouds, wind from left. 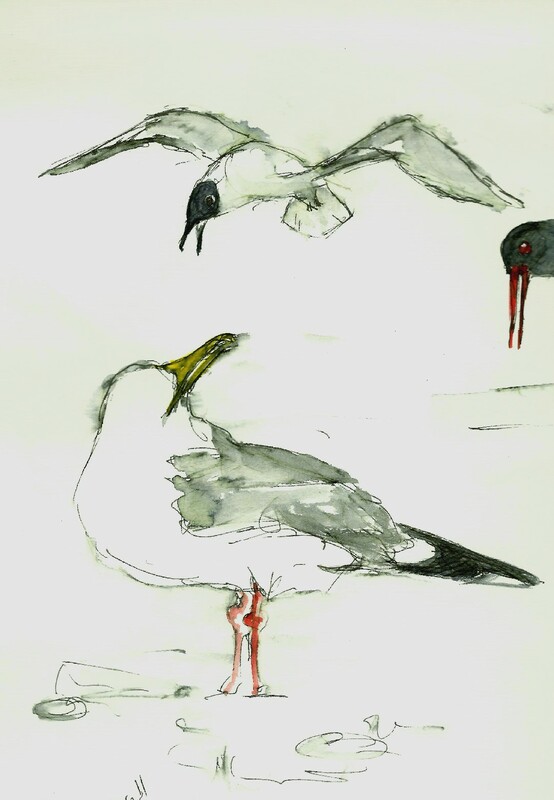 Continuous harsh croaks and calls from the black headed gulls. 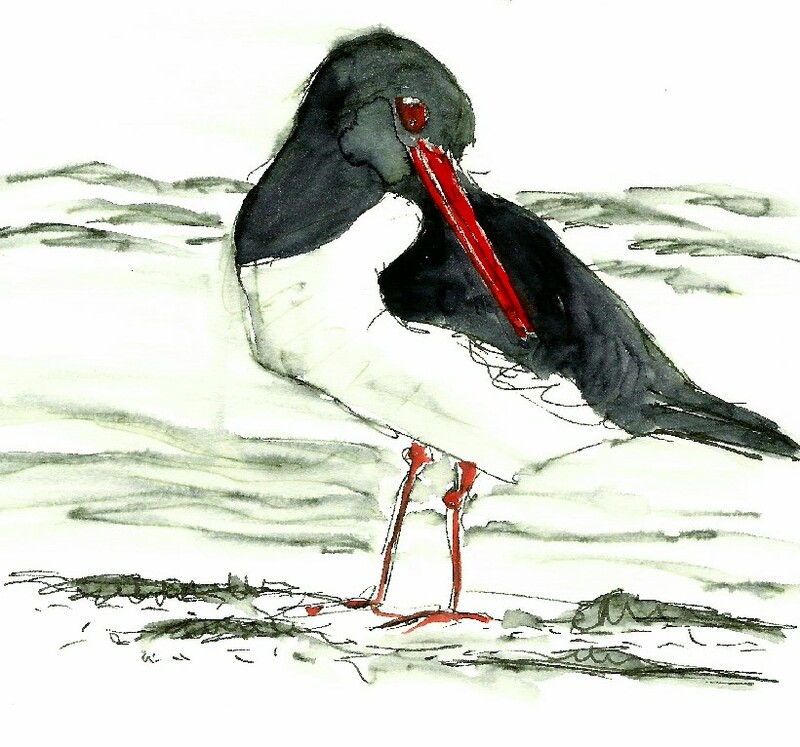 Sudden continuous high piping of oystercatchers as they fly in. 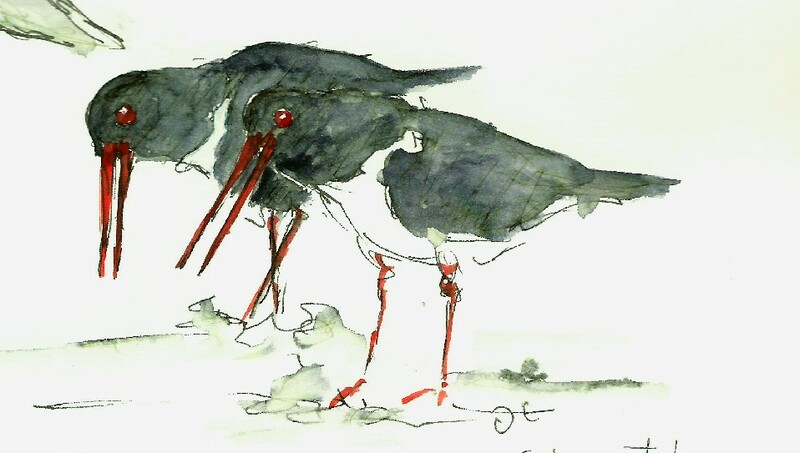 Oystercatchers running together in formation in a pair. Head down, neck forward, piping loudly, bills down and open. 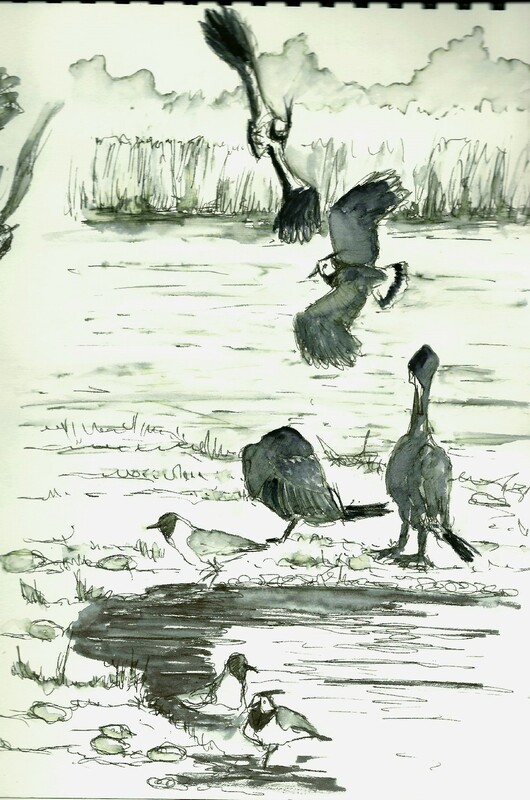 Head dipping and waving, croaking call and deep chuckles as shelduck sees off a rival. 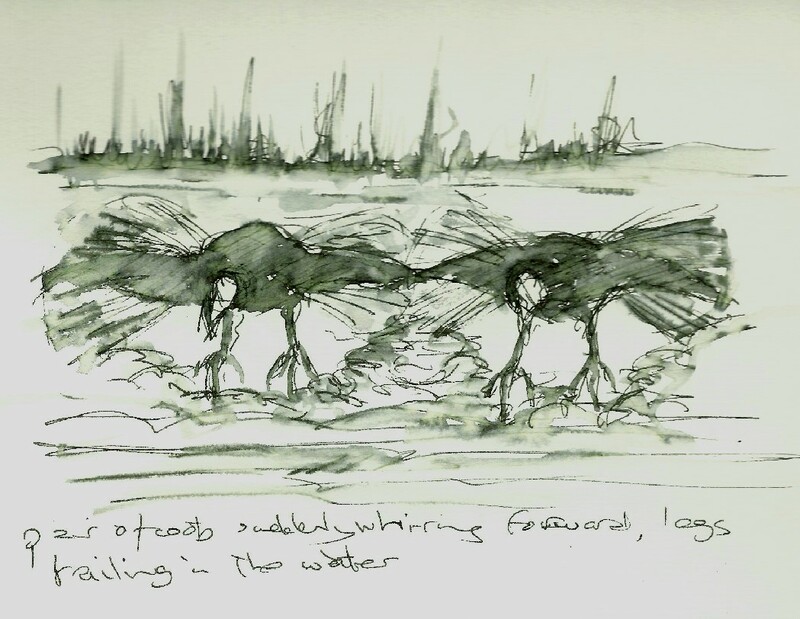 Pair of coots, suddenly whirring forward, legs trailing in the water. As soon as his feet touch the ground, the other flies at him. 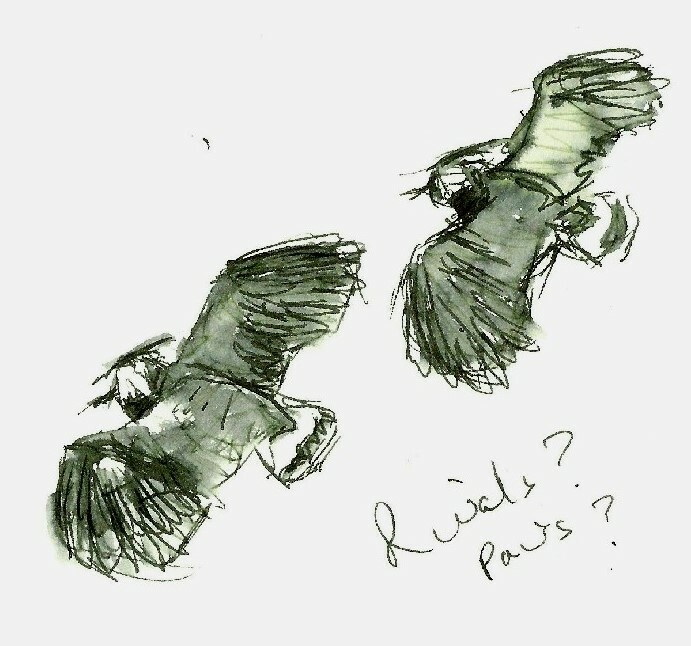 Both soar vertically flapping hard, then veer hard to the right, swoop low to water and come in to land. 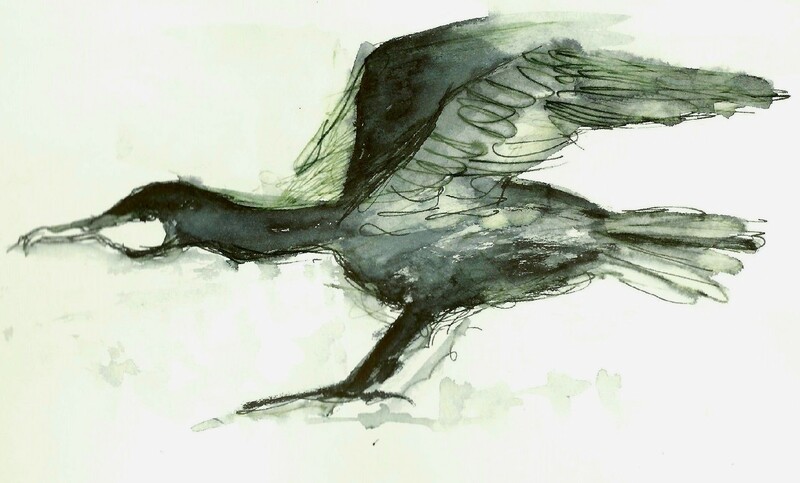 The first lands first and again is chased into the air. More like driving one to exhaustion than courtship. Rivalry continues 30 minutes or more – clearly tiring over time. 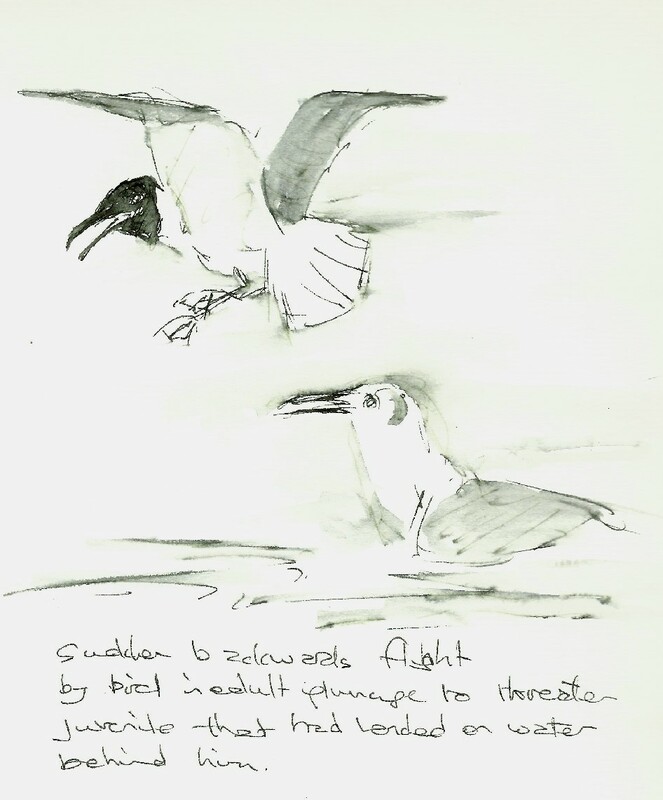 Seems to be tiring – the first spent a long time on the wing, almost in indecision about landing again. 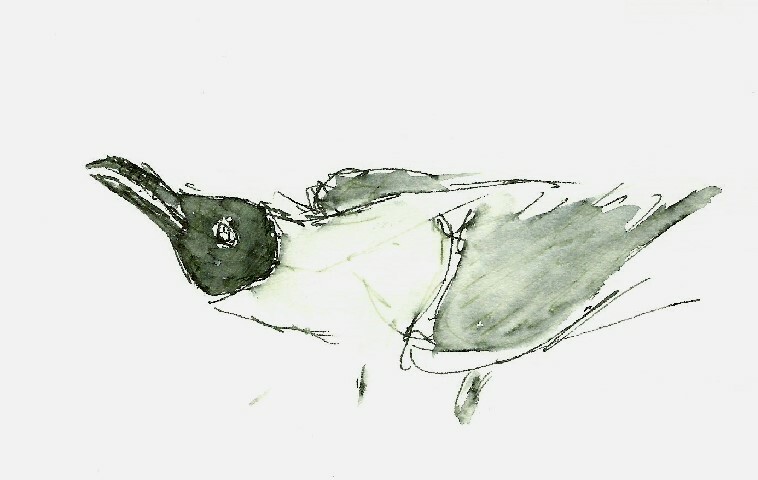 Another lapwing landed and stood aside, not involved in the struggle. At this point I started to hear lapwing calls, but it was not clear if these were made by the competing birds. OK. I am sitting on the sofa posting this while watching a piece of highly intellectual television called “first dates”. 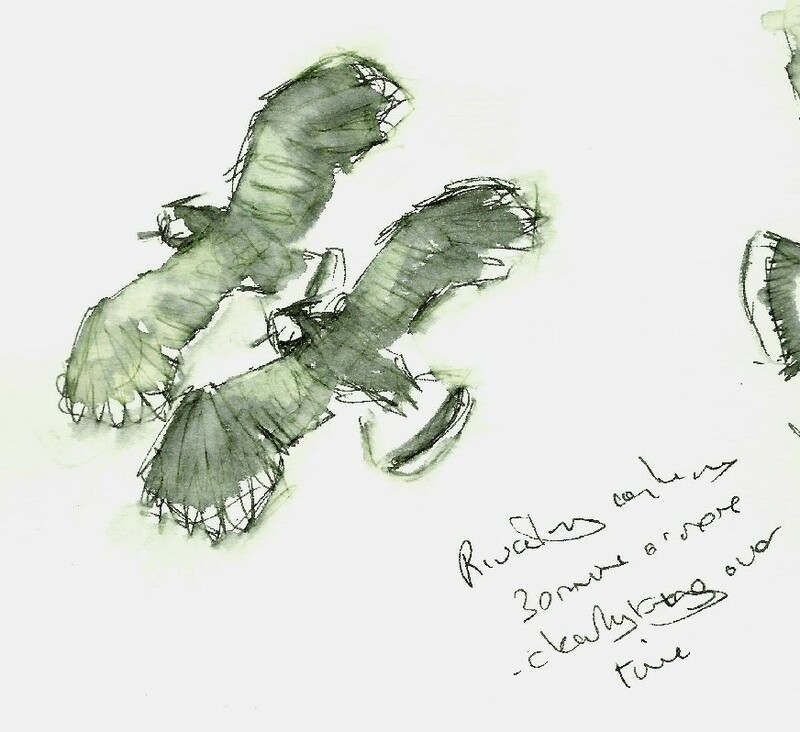 My notes say – flying in formation, almost stopping, upper slightly behind, synchrony in wing beats. Calling as flying “wowo woweee” rising on the last beat. 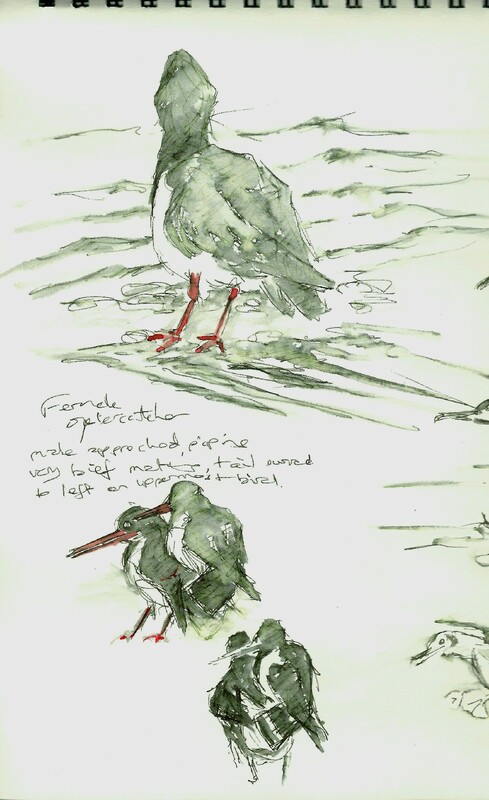 The upper sketch is of a female oystercatcher after coitus. The act itself lasted 30 seconds or so. I tried a couple of drawings to capture this from memory. A bittern was barely visible in the reeds. The bloke who pointed it out to me had also caught on camera a pair of courting great crested grebes. I missed these. I focussed for most part on birds in flight, particularly catching them coming in to land.